Sailing out of Wellington Harbour on Friday the 13th (yes, I know) brought on a mixture of feelings, excitement, apprehension, anxiety, freedom – but the inevitable sensation of leaving without all the jobs done, so many were, but the culmination of renting out the house, moving onboard, preparing the boat, leaving the business was a messy and awkward peak to crest. A million questions roared around in my mind about the boat and whether all those jobs I’d done were done well enough. A moment to calm my mind and think about what counts, holes below the waterline don’t leak, the sails work, the rig is new…. the rest is really just for comfort. Craig was there to cast off our lines with a friendly smile and encouraging words, which was a great way to start the journey. Iris played her guitar as we passed the white lady for the last time for probably a year if not more. Heading across Palliser Bay, the big swell from the previous week’s storm was right on our beam, mixed with sloppy seas and no wind, we rolled and bucked while waves slapped our topsides. The water rushing up the bilge pump drain found it’s way into the cockpit drain, filling the cockpit floor with stinky bilge water. This is actually a safety issue as the Cat 1 regulations don’t allow this, I thought I had sorted it, but there was clearly a hidden plumbing issue – my thoughts started rolling around in doubts and I began inspecting the plumbing in my mind. What is that sound? Is the engine sounding ok? I dashed down below to check the engine bay – all was looking good but the uncertainty was creeping up on me. 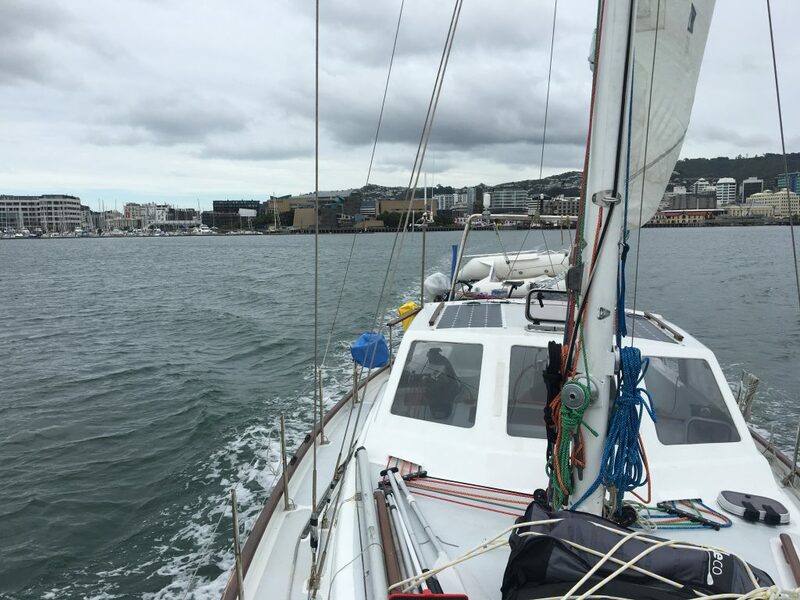 I went back to the cockpit, but the smell of diesel and my unsettled nerves were too much and I experienced my first bout of seasickness…. It’s true what they say though, “just get it out” I had a little vomit and then everything suddenly seemed better. The feeling of impending doom lifted and as we rounded the Cape, we had the swell on our starboard quarter and the boat settled into a rhythm. A little wind picked up and we were motorsailing. An easy sail from there on in, although just after the sun set one evening Iris and I overheard the mayday call and coastguard response from the stricken yacht Erojca, holed off Whangara and about to be washed onto the beach. Why were they so close in? I explained to Iris why we sailed nearly 20nm off the coast and put a reef in before dark. A couple of nights later we were pulling into Gisborne Marina, a big sleep and some of Clare’s cannelloni brought warmth and comfort. The week in Gisborne was spent sorting out our errant plumbing, installing a better solar controller and a few other jobs on the boat that needed taken care of. We were lucky to arrive for the 90th birthday celebrations of Clare’s Aunt Catherine and Uncle Michael. All the cousins were there and it was fantastic to get to know them all better. The plan from here was to sail to Mayor Island in the Bay of Plenty, this trip would be so much easier, but then it was always going to be. Lovely blog post C’ptn Robin! You guys are superheroes… so brave. I think might have to make each of you a cape… but then getting them caught in the rigging… NO CAPES! Awww thanks Bek!!! Maybe eyepatches?